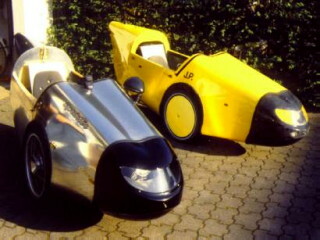 The Alleweder is an HPV (human powered vehicle) or Velomobile specially optimized for everyday use. It was designed by Bart Verhees and is supposed to be the most built velomobile in the world, with more than 500 sold units. It is comfortable because of full suspension and offers 80 litres space for baggage. The aluminium bodywork is unitized (without tube frame), incorrodable and has a very low air resistance, which has a direct effect on the achievable speed. The steering horn can be comfortably used, although you have to become accustomed to its manipulation at first. Handling qualities and stability are good, only with heavy baggage in the boot you have to be careful with turning the corners. This is easily avoidable by storing heavy baggage alongside the seat to reach a better center of gravity. Drum brakes inside both front wheels will stop the Alleweder quickly, if necessary. The increased weigth of 35 kg, compared with a normal bicycle, will only be noticed on ascents and acceleration. For rainy weather there is a additional cover, so there is only your head left to get wet.